The first section of chapter four of the author's Victorian Types, Victorian Shadows; Biblical Typology in Victorian Literature, Art, and Thought, which Routledge & Kegan Paul published in 1980 and reissued in 2015. The author, who retains copyright, first created a web version in 1998, which he reformatted in in 2007 and again in 2015. 1. See my "Ruskin and Harding on Nature's Infinite Variety." n encountering the many appearances of typology in the visual arts of the period, the student of Victorian culture confronts three questions. First, how does Victorian art use typological symbolism? Second, what is the nature of visual uses of typology -- or, put differently, what is the nature of typological images that appear in the visual arts? Third, what particular relation exists between visual and verbal applications of typology? Before attempting to answer these last two questions, which lead us into problems of aesthetics and semiotics, I should like to examine some of the important ways in which typology influenced Victorian art and art theory. Jacopo Tintoretto. The Annunciation. c. 1582-57. Oil on canvas, 116 x 214 l/2 in. Scuola di San Rocco, Venice. The chief inspiration for such attempts, according to Hunt, came from John Ruskin. 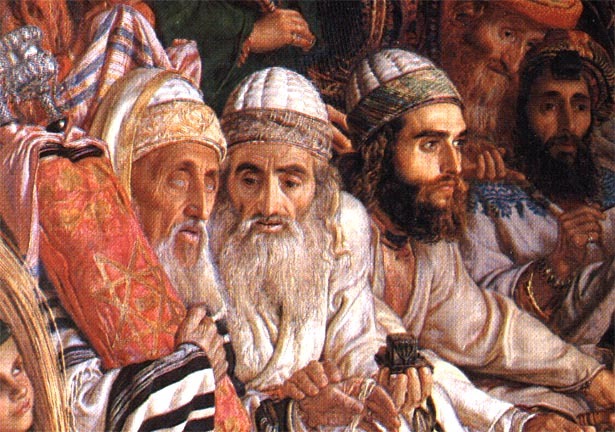 After a fellow student had given Hunt the second volume of Modern Painters (1846), under the very mistaken belief that its author had converted to Roman Catholicism, the young painter found himself deeply moved by Ruskin's high conceptions of the art, but one passage in particular, to which he recurs several times in his autobiography, provided him with a specific artistic program. While explaining the penetrative imagination of the great artist, Ruskin drew upon Tintoretto's painting of The Annunciation in the Scuola di San Rocco, Venice, for an example which turned out to have far greater effect upon himself and his contemporaries than he could ever have expected. 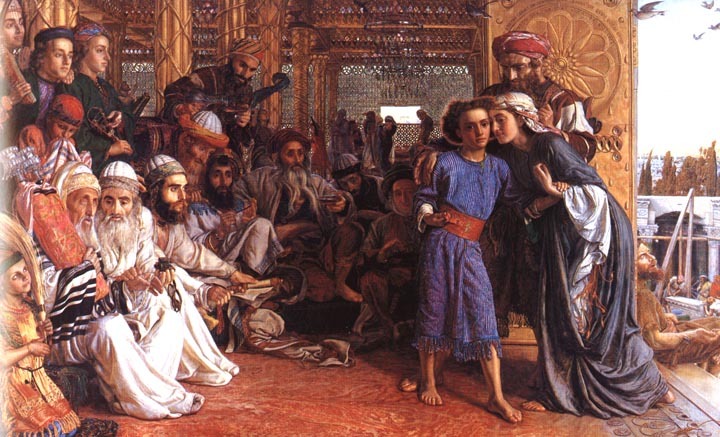 The critic first explains that the painting represents the Virgin sitting beneath a ruined palace vestibule. "The spectator turns away at first, revolted, from the central object of the picture forced painfully and coarsely forward, a mass of shattered brickwork, with the plaster mildewed away from it, and the mortar mouldering from its seams." Explanations for such coarse realism exist, say Ruskin, in the fact that Tintoretto, who draws upon the conditions of contemporary Venice, is trying to suggest Joseph's occupation as well. But as the spectator examines this image of earthly desolation, he realizes suddenly that these realistically presented visual facts bear far more important significance. In fact, the entire composition of the picture leads the viewer's eye to "an object at the top of the brickwork, a white stone, four square, the corner-stone of the old edifice the base of its supporting column." This cornerstone, a visuai allusion to Psalms 118, is a type, and when the spectator recognizes its meaning, he finds himself released into a world of Christian meanings: "The ruined house is the Jewish dispensation, that obscurely arising in the dawning of the sky is the Christian; but the corner-stone of the old building remains, though the builders" tools lie idle beside it, and the stone which the builders refused is become the Headstone of the Corner" (4.264 5). 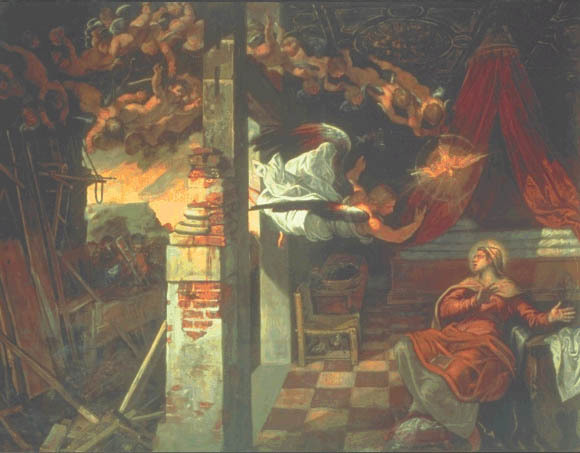 That passage from Psalms 118 about the cornerstone refused by the builders is a commonplace prophetical type of Christ, and, as Ruskin has demonstrated Tintoretto has employed it in a most traditional way to reinforce the central meaning of the annunciation theme.